Garden Flow is a projection mapping installation that creates an ideal environment to do yoga. The Griffins are looking for a single installation that will “amplify the natural feeling of the space” in their garden. Specifically, they are looking for a work that can identify and magnify specific, possibly unseen natural phenomena taking place within their designed outdoor environment. Because the clients are yoga enthusiasts, we wanted to provide them with a space that displays data and calming visuals that enhances their awareness of their body. We interviewed yoga practitioners and many of them expressed the importance of breathing and visualizing their Heart Rate Variability (HRV), as having a high HRV is directly correlated with "greater cardiovascular fitness and be more resilient to stress." 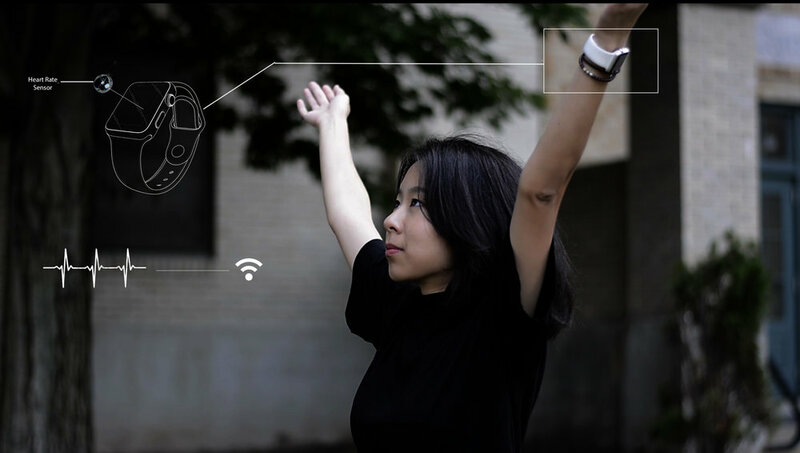 The project utilizes a heart rate sensor to display the user's physical state onto the garden. This connection between user and garden magnifies the unseen: the user's health, projected onto the surroundings they enjoy every morning. The projections will visually represent the user's heart rate and allow them to focus on controlling their heart rate and breathing while they are doing yoga. Rather than using numbers or graphs, we wanted to design an abstract animation that is also aesthetically pleasing. This particle animation is used to display an ideal breathing pattern. The change in color, speed and shape of the particles represent when to breath in and out. The user could use the animation to focus and become more aware of their breathing and slow their heart rate down; for example, to breathe in when the color turns red, and breathe out when the color changes to a light pink. 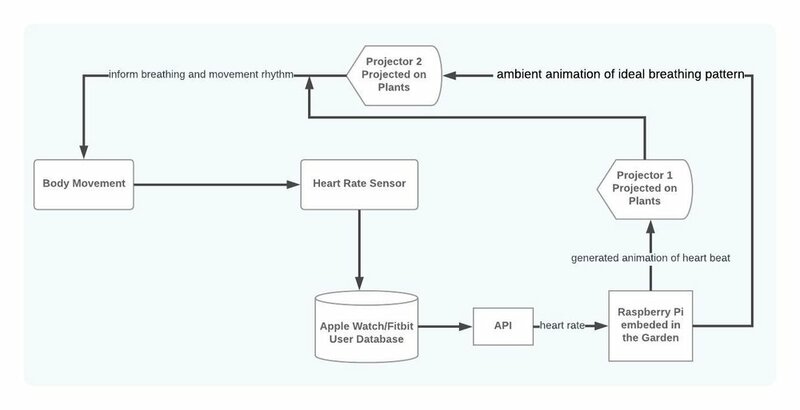 The rhythm animation is used to project the user's data upon their surroundings is a visual representation of the user's heart rate. The birth of the circles is generated based on the heart rate rate input. This will allow the user's to watch their heart rate and focus on rhythm. Using TouchDesigner and a heart rate sensor, we created a simple prototype (Minimum Viable Product) for our clients. Our hope is to use existing technology such as Fitbit or Apple Watch to allow wireless connection between the user and the projection.